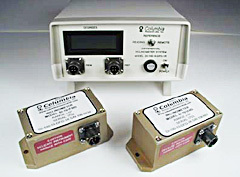 The Columbia Model Dl-100-10-DFD-1R Inclinometer System is a unique Differential tilt measuring device which allows matching the slope of two remotely located surfaces. It is particularly useful in construction and shipbuilding. The readout can be set to indicate the absolute tilt of either sensor or the differential angle between them. 117 Volts AC @ 49-63Hz, 2.5 Watts Typ.